Marius Sandbu - IT blog | Containing ramblings about Cloud, End-user computing, software defined datacenter and IT-security related information. Also with my blogging I have gotten alot of requests on email about different topics, and sometimes it might go days before I even have the time to respond! Not because I don’t want to, just that there are only 24 hours in one day, and my day to day schedule is pretty full. Now spending time on forums it pretty time consuming and just waiting for a reply from someone, but nowadays I find myself moving more and more away from forums and move more into Slack. Slackis a real-time messaging tool, which I now use to collaborate with many different partners/vendors/programs and such its an easy way to IM with others. Now a while back I decided to create a Slack Team dedicated to NetScaler and today we have about 40 people in the different channels there, which is an easy way to get in touch with alot of knowledgeable people if you just want to ask a question or want to discuss features . And a couple of days I ago I also created a Slack Channel just for the purpose of XenDesktop / XenApp as well, where people are joining slow and steady. If you want to join either of these channels, send me an email to msandbu@gmail.com and ill get you invited. So last year I switched jobs to Exclusive Networks here in Norway, which was distributor which focused on Nutanix, Arista, vArmour, AviNetworks, VMturbo as part of their BigTec portfolio and so on which was a looooong gap from my regular day-to-day work which focused on Microsoft, and ohhh boy did I learn a lot during this one year time! especially on HCI and pure data center networking. But for personal reasons I’m again decided to switch to another opportunity which was as a Cloud Architect at Evry. Evry is one of largest IT companies in Evry, and they just so happen to have an office 2 minutes walking distance from my house! So I look forward to meeting new colleagues and learning even more in the upcoming months! 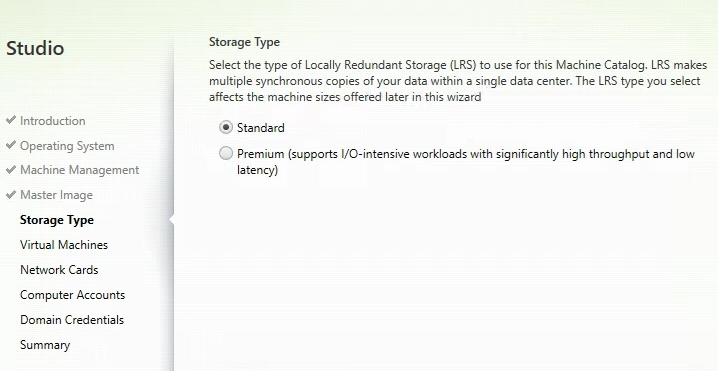 Last week, Citrix announced support for Microsoft Azure Resource Manager in XenDesktop. 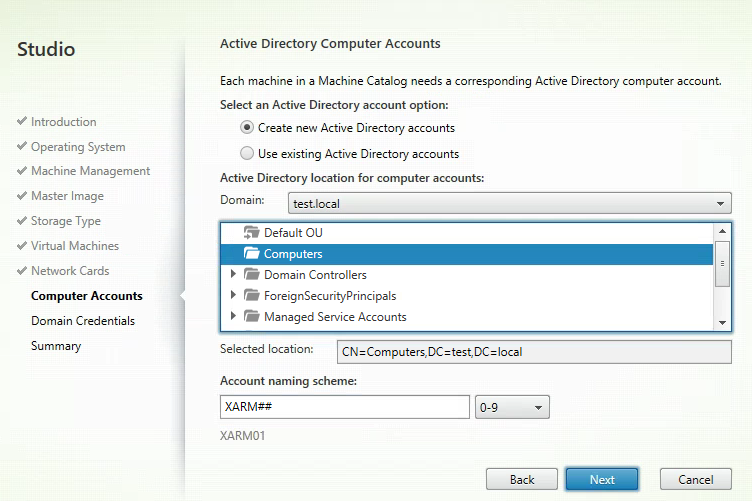 As of now this feature is only available in Citrix Cloud. Because Citrix has the common policy that features comes in Cloud first then on the on-premises deployment. 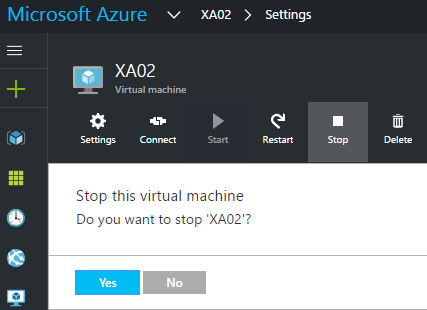 Using Azure Resource manager the setup has been simplified alot! My lab is quite simple to setup, we need an Active Directory setup, an Windows Server 2012 R2 with the cloud connector installed. 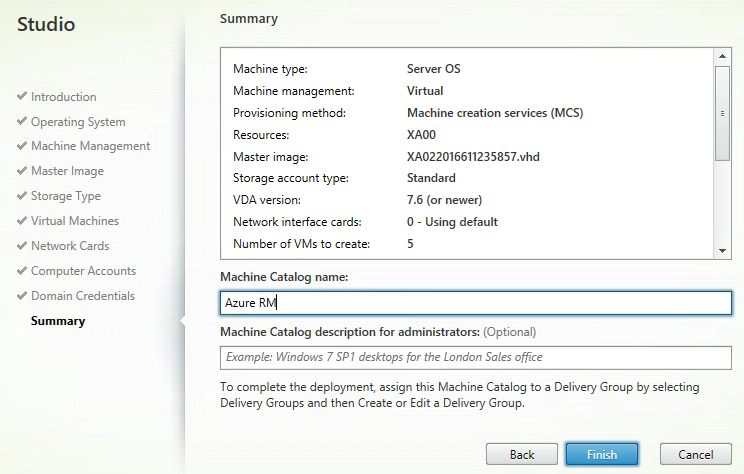 We also need a Windows Server 2012 R2 with the RSDH role installed with the VDA agent. So we also need a Citrix Cloud sub or a trial, when doing into the management console and into connection we will now have Azure as a Connection Type. 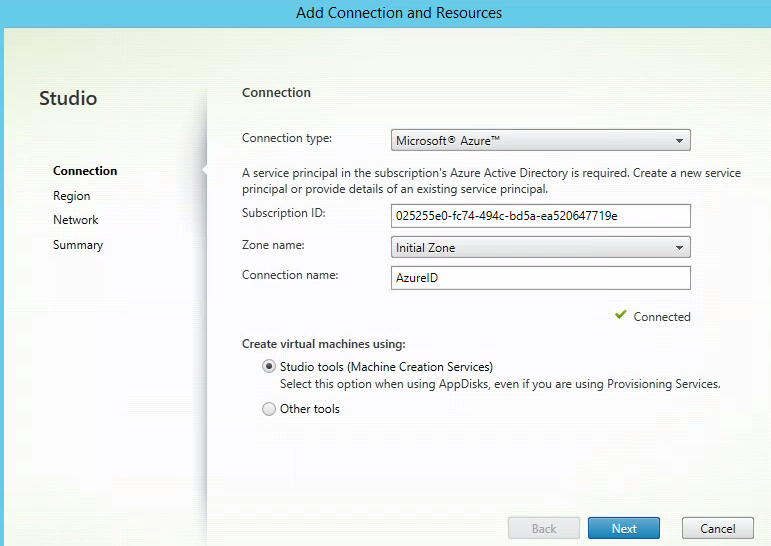 We need to enter a subscription ID which we can find from within the Azure Console, and define a Zone name for these resources. 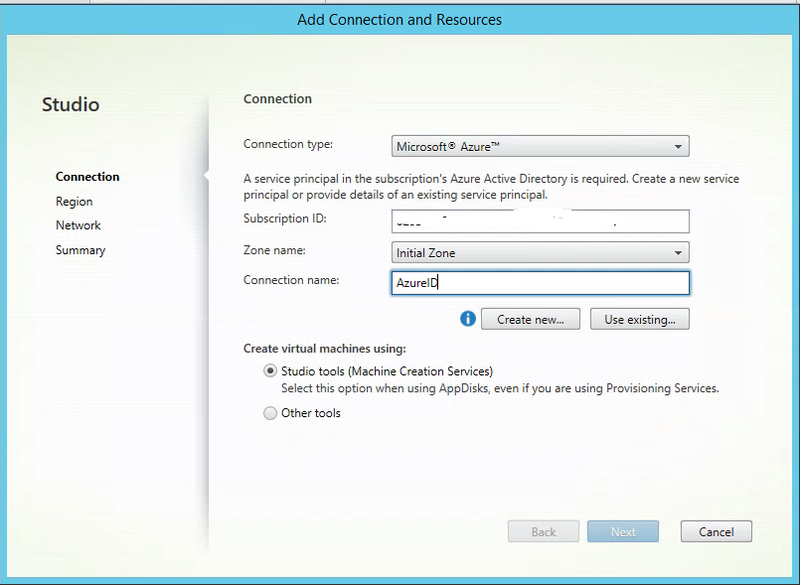 Then choose Create New, from there it will ask you to authenticate against Azure AD using your subscription credentials. 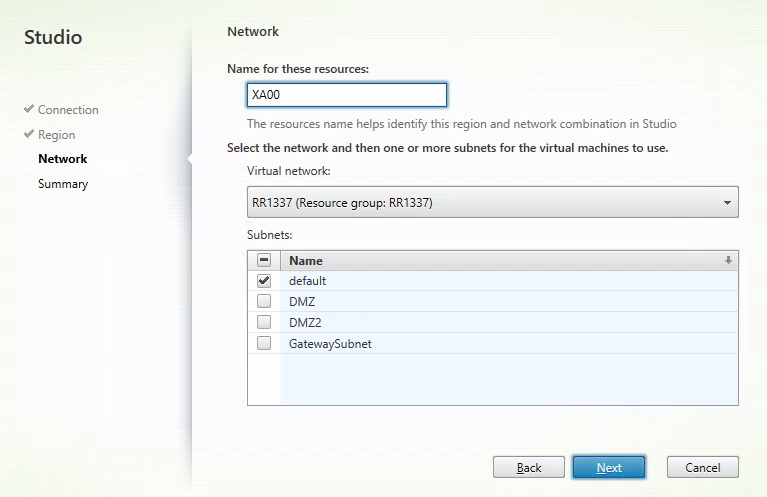 And lastly define which Virtual network (and subnet) you want the connection to provision resources in. We can define use of multiple subnets here. The resources that appear in the wizard will depend on what already exists in the region and the active subscription. Now that we have an connection to Azure we can start creating our machine catalog. So now after we are done with this we can go on with the setup within Citrix Cloud. 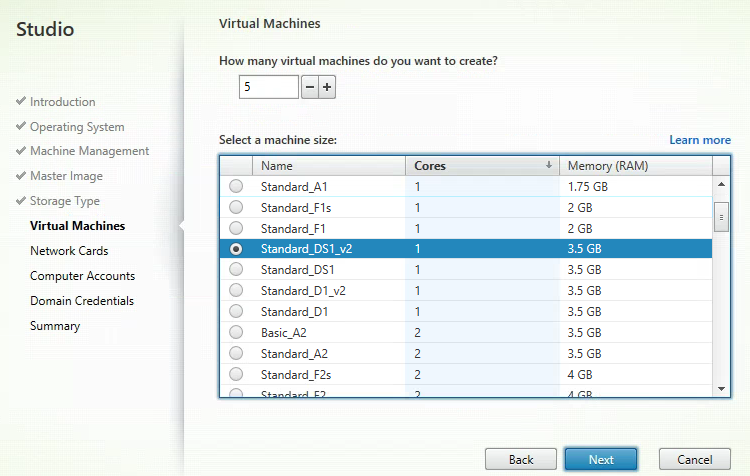 Now before we go ahead and find the master image we need to find where our Virtual machine template is stored in. So we need to locate the storage account that is uses. 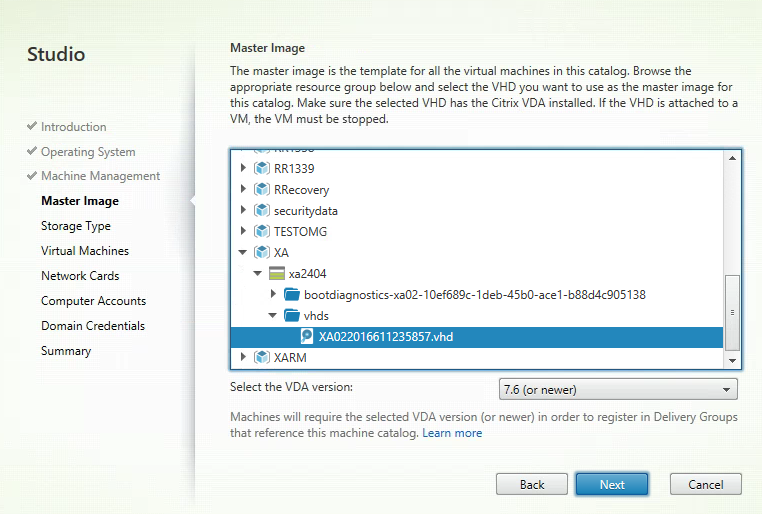 So when choosing Master image, we first need to locate which resource group the virtual machine is located in and then going into the stoarge account, vhds and choosing the VHD file of the virtual machine, which will be uses as the template image. We now also have the option to choose if we want to use Standard disks or Premium disks. 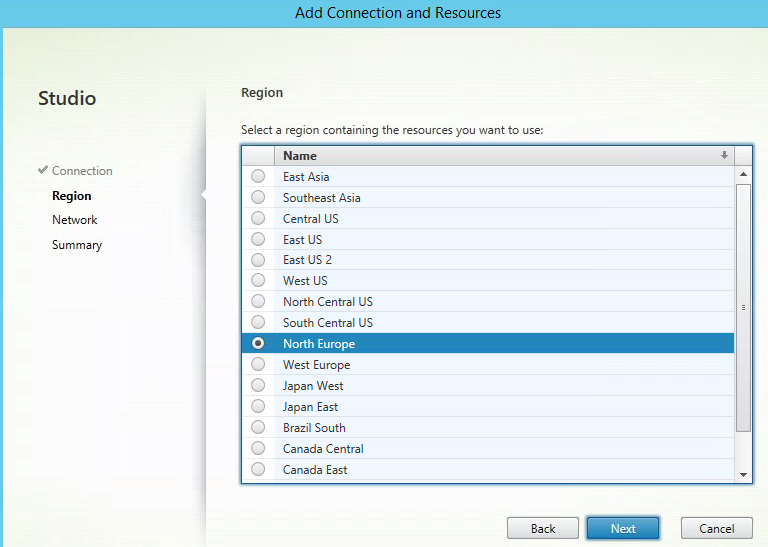 And then we need to choose where the NICs are going to be connected to, this is defined in the connection resource. And then we have the same procedure for Computer accounts. Then when we click Finish, let it roll! So I had a friend reach out to me earlier today, because he was having some troubles with a NetScaler Gateway setup where he was unable to launch ICA sessions after setting up the Gateway and Storefront. All certs were in place, and authentication worked as it should, and STA was configured properly. No events appeared in Storefront, and after a while he sent me a trace file which I could do some more digging. So this basically that the SNIP address is trying to establish a TCP handshake with the VDA agent but It does not receive any reply from the destination address. So it was basically an Firewall ACL that was missing for the ports against the particular subnet! So make sure that the firewall rules are in place before doing a setup! So is there any way that I can confirm that a particular NetScaler SNIP is unable to communicate with the VDA before blaming the networking team ? Just remember to specify a NetProfile if you have multiple SNIP’s which are able to reach the server in the backend. 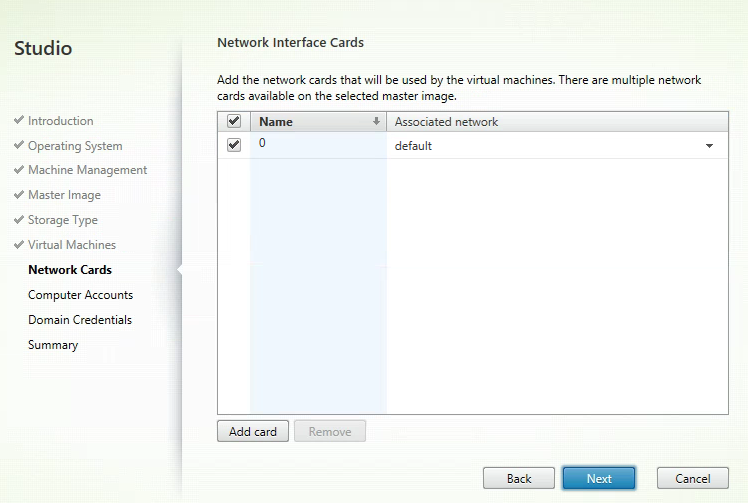 NetScaler can round-robin use SNIP’s if there are multiple available which can reach the server network. A few weeks back, VMware announced the acquisition of Arkin, with their platform (Arkin Visibility and Operations Platform) Arkin has out-of-box integrations with virtualization (ex: VMware vCenter, VMware NSX, Palo Alto Virtual Firewall) as well as physical infrastructure components (physical chassis, switches and routers), providing end to end visibility and analytics into the network. 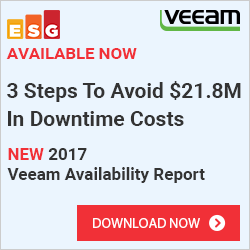 Even though VMware has alot of built-in feature in NSX, visibility of the networking combining the usage of VXLAN, VLANs, Hardware vTeps, Distributed firewall rules and so on makes it hard to troubleshoot in case of packet drops, firewall rules not configured properly, and seeing the direct traffic flow. Because even if NSX bring alot of good features to the table it makes networking alot more complex, especially those which are used to an old fashion networking stack. So will Arkin make this alot simpler? I decided to take a closer look at the product. (Since it wasen’t simple to get a demo license, I decided to try the online trial that they offer, which simulates a “real enviroment” which mixes VXLAN, VLANs and different switches (Cisco, Arista) and some dFW rules in the mix. Same if I search after VXLAN, I get of all VXLAN’s definined from the NSX controllers. So if I click on a specific VXLAN I get a detailed overview of the VXLAN, which ESXi hosts have the VXLAN mapped, which dFW rules are in place, and in the middle I see which core switches act as the upload for each dwSwitch. I can also see which objects have been changed, and see the L2 metrics for the specific VXLAN. I can also see alerts for differnt objects within the topology. The most awesome feature is VM path topology, being able to see how the traffic flows from a specific virtual machine to another. In this case we can see that a virtual machine has to go a dVRF, go to an edge router and the to the VM on another host. Also in the mix you can see that we have some Palo Alto extensions setup has which are presented in the topology as well. Now Arkin provides the full visibility into the networking segment, I think the issue is how VMware is going to license this as a product! I’ve seen rumours that It costs about 750$ per socket on hypervisor level (and integrating into the physical network is no additional cost) and with NSX costing about (standard 2000$, Advanced 4500$ and enterprise 7000$) I’m guessing this is going to be only part of the enterprise license, but I hope that this does not afffect the pricing level as well. 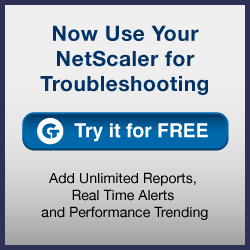 Since it gives NSX a much needed visibility boost which vRealize haven’t given us so far. Remember back to the Windows XP/Vista days? Life was alot simple from a security perspective. Yeah we got virus and malware, yeah we got spyware and yeah we got malware like we have been used too for the last decade. What did Microsoft have to offer us in terms of protection and security mechanims? Windows Firewall could filter ingoing and outgoing traffic! Drivers needed to be digitally signed! But of course alot was still up to the third party vendors which delivered their endpoint security solutions (Norman, Symantec, Trend, etc…) Which was there to stop whatever else tried to come in. Because now organized crime is the largest threat and we have different types of Ransomware which can automatically encrypt files and require large amounts of money to decrypt them. These ransomware’s are always evolving, which makes it hard to use signature based detection systems, so it often the case to try and minize the damage. Another issue is username & passwords, with the large amount of different websites getting hacked each day with people leveraging the same username and password both at work and for personal stuff the use of two-factor authentication is becoming more and more the defacto standard. And of course in larger enterprises there is always the risk of getting hacked from the “inside” and having security mechanisms which can protect against these types of attacks. So there have been numerous security enhancements in Windows 10 because Microsoft wants the consumers to have built-in protection instead of the 60-day trial of some “random” third party vendor they get when the buy it from the store. So what’s new from a security persective in Windows 10? Internal data structures that the heap uses are now better protected against memory corruption. Heap memory allocations now have randomized locations and sizes, which makes it more difficult for an attacker to predict the location of critical memory to overwrite. Specifically, Windows 10 adds a random offset to the address of a newly allocated heap, which makes the allocation much less predictable. Windows 10 uses “guard pages” before and after blocks of memory as tripwires. If an attacker attempts to write past a block of memory (a common technique known as a buffer overflow), the attacker will have to overwrite a guard page. Any attempt to modify a guard page is considered a memory corruption, and Windows 10 responds by instantly terminating the app. So even all these security features are included in the operating system. What if a disgruntled employee wants to take files outside of the buisness or if files get lost on a USB thumbdrive? There are more features to come! This feature will allow for seperation of data between personal and corporate and wherver the device it resides on it can be wiped. Data based upon policies can be encrypted at rest. And using this will also be visible when saving files to the local system, where corporate content can be stored in specific folders. Now this feature handles data protection and leak protection of files. But back to ransomware and such, in many cases it is a case of minimizing the threats that occur, and get the overview of what’s happening. Microsoft found that it takes an enterprise more than 200 days to detect a security breach and 80 days to contain it. During this time, attackers can wreak havoc on a corporate network. 1. The Client: built into Windows 10 Anniversary Update, that logs detailed security events and behaviors on the endpoint. It’s a fully integrated component of the Windows 10 Operating System. 2. Cloud Security Analytics Service: combines data from endpoints with Microsoft’s broad data optics from over 1 billion Windows devices, 2.5 trillion indexed Web URLs, 600 million online reputation look-ups, and over 1 million suspicious files analyzed to detect anomalous behaviors, adversary techniques and identify similarities to known attacks. 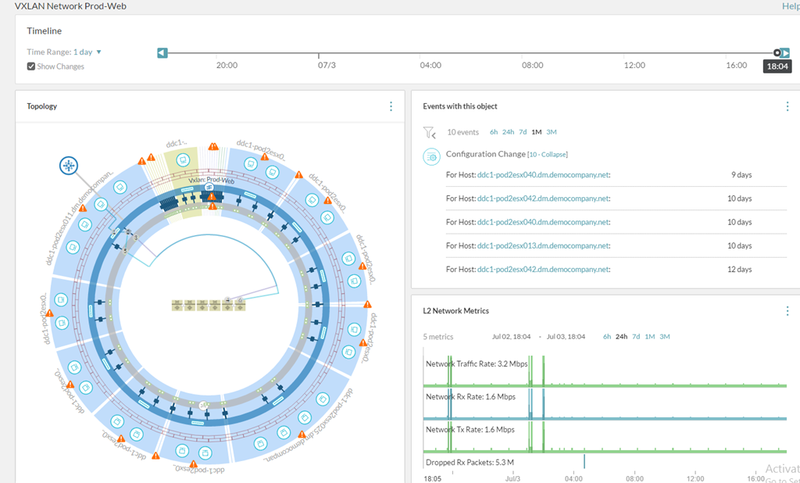 The service runs on Microsoft’s scalable Big Data platform, and combines Indicators of Attacks (IOAs), behavioral analytics, and machine learning rules. 3. Microsoft and Community Threat Intelligence: Microsoft’s own Hunters and researchers constantly investigate data, identify new behavioral patterns, and correlate collected data with existing Indicators of Compromises (IOCs) collected from past attacks and the security community. Since the agent is already “built-in” its a matter of on-boarding the client and getting it up and running. As part of the public preview I have one of my computers added to the solution. I can also do more deep-dive into a specific event to see what happend. 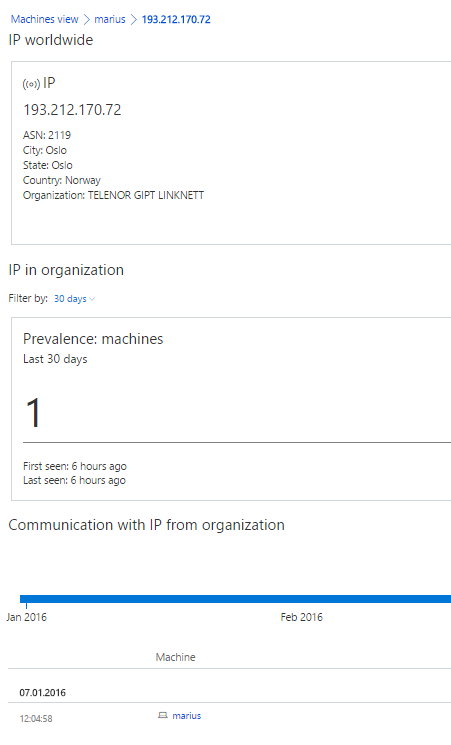 We can also deep-dive into detected malware to see occurences world-wide from Microsoft (Alot of EICAR occureences… ) Also I can see if this has been observed from other agents in the organization. NOTE: I had some issues with the agent on my laptop since it for some reason only reported back data every 60 minutes, this was because my laptop wasn’t connected to a power source, so in order to reduce battery usage is falled back to that setting. It will do the same on a metered connection. When I connected a power source again I’t went back to sending data every 5 minutes.